Wish you had room for a home gym? You might! 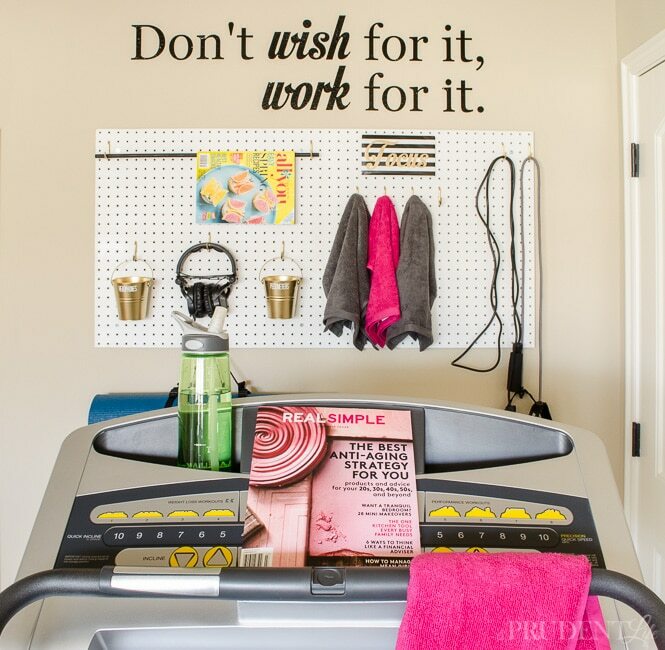 We created an organized exercise space in a corner that has everything we need to stay fit. I don’t know about you, but Spring always inspires me to get healthier. I know for most people January 1st is a trigger, but I find it much easier to make better eating and exercising decisions when it is warmer and the sun is shining. I decided to combine my love of magazines, my pledge to read more non-electronic stuff, AND my new Spring commitment to health into one fun organized space. 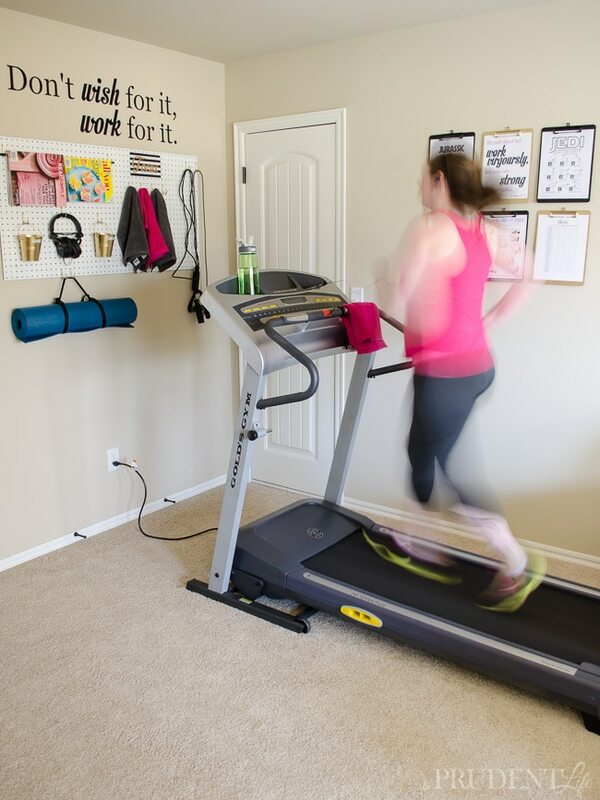 We’ve had a treadmill tucked into the corner of a room, but it was NOT a fun space. After an inexpensive makeover, I’m excited to go up and work out. This was actually a very quick, easy, and inexpensive project. 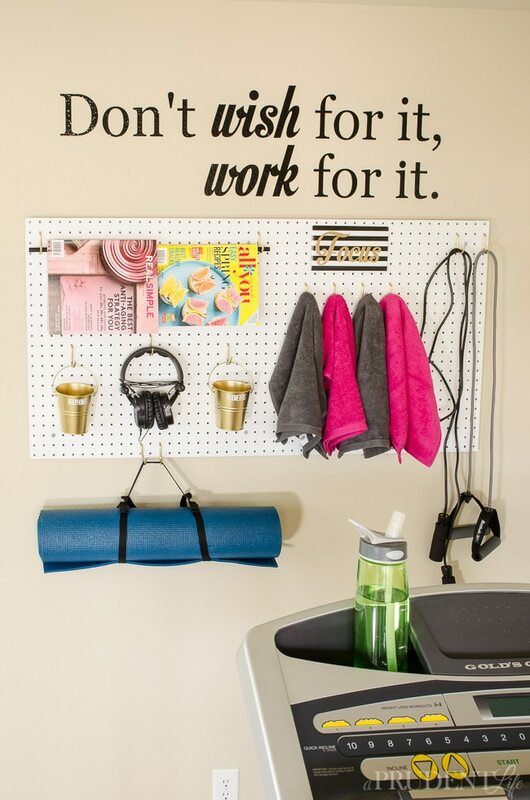 The pegboard came from the hardware store already to size – no saw required! The only “tricky” part, was remembering that in order for pegs to go in a pegboard, it can’t be flush against the wall. We used some cheap plumbing washers as spacers as seen below. With the pegboard away from the wall, we inserted screws and added the spacers. Then we lifted the board to the wall and attached the screws to wall anchors. 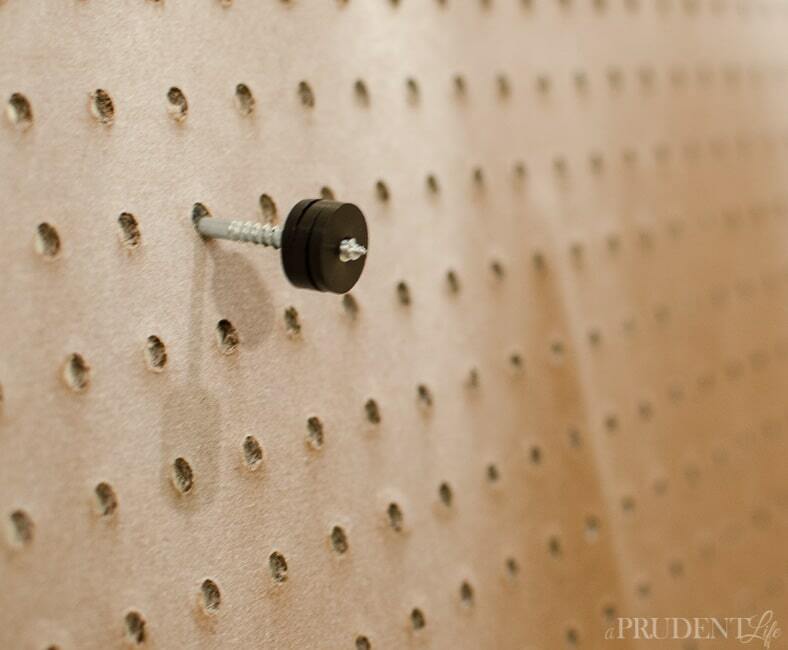 The only tool you’ll need is a drill or electric screw driver and potentially a stud-finder to determine if you need anchors or if you can attach your pegboard right to the studs. Once the the pegboard was hung, the fun part began. I knew there were some vital components that had to be stored on the board. First was a place to store a few magazines. 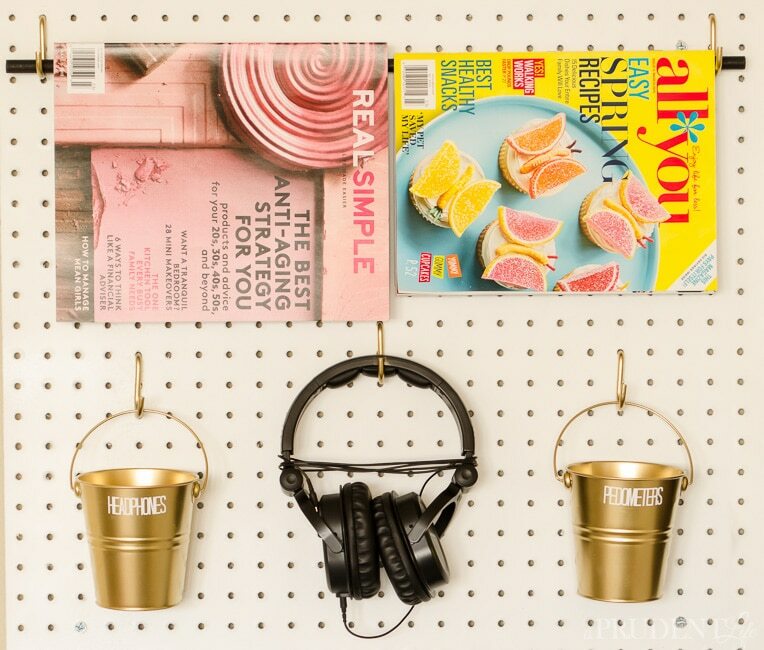 I used two hooks and a dowel rod to create the perfect magazine rack. Even when I don’t want to work out, a good magazine can lure me upstairs for a little quality me-time on the treadmill. We also needed a place to store headphones and our pedometers. We get a huge discount on our health insurance by using the pedometers to show that we completed 10 days of walking/running each month. Metal buckets from the Dollar Spot at Target were perfect to hold both the pedometers and my headphones. My husband usually watches Netflix on the treadmill with his serious headphones, so I added a hook for them as well. I MIGHT have also used this project as an excuse to buy color-coded gym towels while I was Target (pink for me, gray for hubby). I grabbed two for each of us so we could rotate and still have one while the other is waiting to be washed. Cute + functional! There was just enough room left to hang up my yoga mat, jump rope, and exercise bands. Here’s the view from the treadmill. I’m kind of in love with the quote we added above the board in vinyl. Next to the treadmill, I couldn’t let the wall space go to waste. 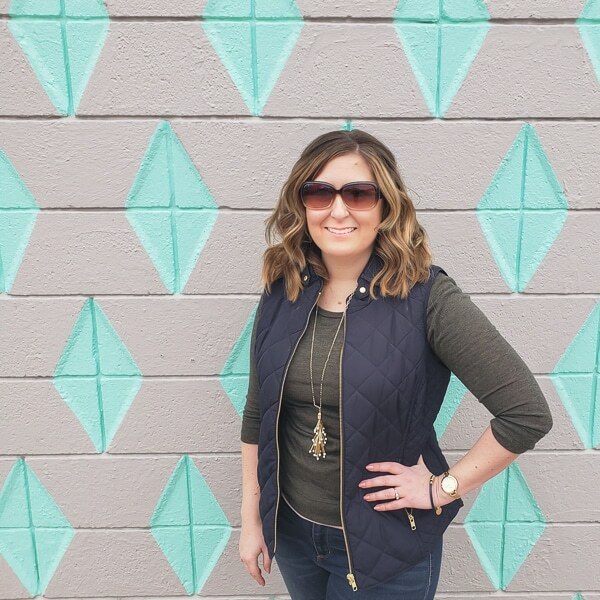 I’ve always wanted to do a clipboard wall, and this was my chance! I spray painted the clipboards black and gold and then used a mixture of printable exercises I found online (here and here) and printables I created. Proverbs 31:17 is the perfect verse for this space. The clipboards will make it really easy to switch out exercises. I’m often motivated by exercise routines in magazines. Now I can rip them out and put them right on the wall! This has always been an awkward corner because we can’t block the attic door. I wish I would have thought of this arrangement three years ago! It’s amazing we could turn a small corner into a little mini-gym. As you can see, I totally got a workout during the creation of this post! Does Spring motivate you to set aside a little me-time for exercise? What’s your favorite at home work out? I really need to set aside some time to start working out. This is a great space you created for that. Thank you! I’m hoping having a fun space to escape to will be the final bit of encouragement I needed to get into a good routine. Love it Melissa! 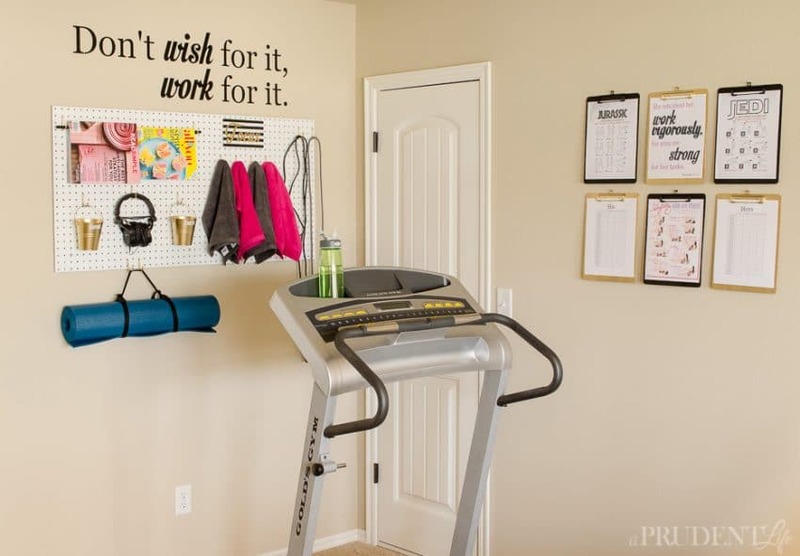 I need to get hubby to clear out some space in the garage so I can make my own little workout space! A corner of the garage would be perfect! I was surprised how little square footage was needed to create an exercise area that had it’s own “feel”. I love the little space you created! So perfect! 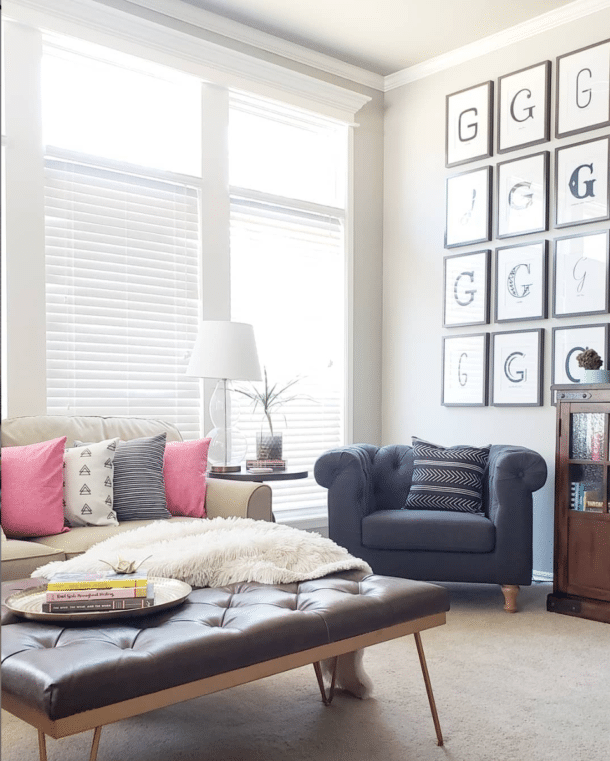 What a fun space you created, Melissa! Pinning! We moved our eliptical machine to the corner of our guest room last year, but I have yet to make the space really function like a home gym! Thanks for all the great ideas and the inspiration to finally get it pulled together! And thanks for linking up at The Creative Circle! Can you tell me where you got the “focus” sign that’s on the peg board? I made it! It’s just wrapping paper over a piece of cardboard and then I cut the word out of gold vinyl with my silhouette machine. I could make a nicer version for you and list it in my Etsy shop, just let me know what size you would like it to be and I can come up with a price! What is on your his and hers board? 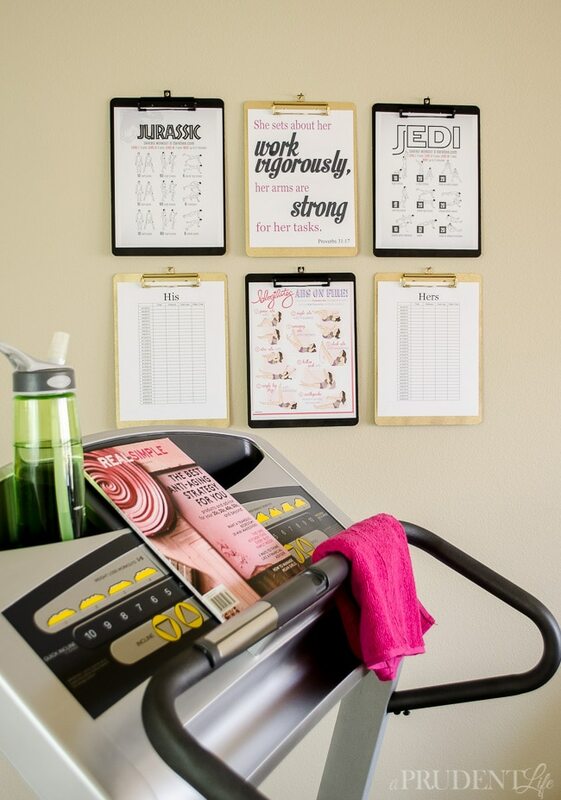 My boyfriend and I are looking to add something like this to our home gyms and I’m trying to think of ways to organize our workouts since we do different things. We made simple tracking sheets for those board to log how long we could plank, how many pushups, and I think how many miles we went. You could definitely do different tracking sheets and maybe rotate what you tracked monthly to keep things fresh!